The underrated, yet still life-changing NetEnt jackpot slot, does it again! The full force of the gods comes crashing in to Kevin’s lap. Well, maybe not the full force, as he didn’t walked away from the Vera & John mobile casino with the Hall of Gods Mega Jackpot, which currently stands at over 1.7 million at the time of writing. However, Kevin’s story is still one of a good night with friends, where he just happened to land one of the other 2 jackpots worth a still very decent £73,910. Here’s why he decided to play, and his reactions to what turned an ordinary Saturday night into one to remember. Playing slots is fun whether you play alone, with your partner, or with friends. And Kevin now knows that ignoring your friends for some simple mobile gambling can pay off. Because who hasn’t sat in a room with family or friends and ignored each and every one of them, your head buried in your phone? But this time instead of just checking Instagram or Facebook for the billionth time that day, he opened up his favourite casino site, Vera & John, and looked for a game to play. And that game was the millionaire-making NetEnt jackpot slot which drew him in with the chance for big payouts. We don’t blame him, with 3 jackpot and one of the most popular jackpot games of 2017, he had good reasons to play. That said, full of Viking gods, this 5 reel, 20 payline slot with a 0.20 minimum bet has more than just 3 jackpots to play for. With serpent expanding wilds, which can cover more than just 1 reel at a time, plus 10 – 20 free spins with 3x multiplier this medium variance game rivals the likes of Mega Fortune (also by NetEnt) and Mega Moolah by Microgaming. 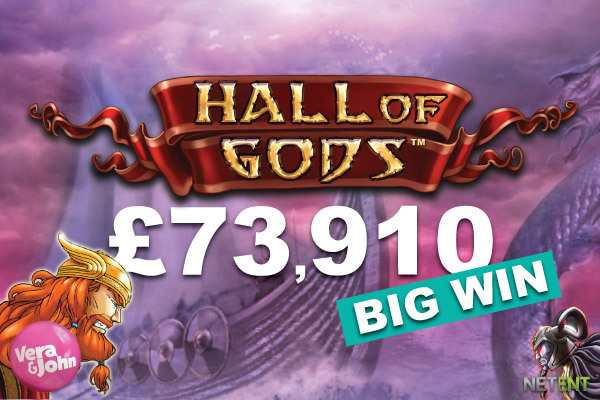 Hall of Gods is a casino game that often gets overlooked for the far more fancier and luxurious NetEntertainment jackpot games, like Mega Fortune Dreams, which paid out more in winnings in 2017 at over 30 million than Mega Fortune or Hall of Gods. That doesn’t mean you should play it instead, and Kevin has 73,910 reasons in his bank account because he ignored the fancy and went straight for the guts. Even though he chose a video slot which may create big payouts, Kevin didn’t really think that he would walk away with one of the three jackpot prizes. And that is pretty much how every other jackpot slot winner story goes, no one ever really thinks that they will win, but we hope that, deep down, we do. Which is what makes winning a casino jackpot, no matter how big or how small, all the more rewarding. Well, most new slot winners like to keep quiet, maybe tell a few close family members, but until the money’s in their bank account they don’t go celebrating. Not Kevin. He went and took the friends who he’d been hanging out with, and who he ignored to play the Hall of Gods slot machine, out for dinner and drinks to celebrate in style. But it wasn’t until the morning after the night before that he realised he’d actually won a considerable sum of money at this online gambling site. If you’re looking for a new slot to play whether online or on your mobile phone you could choose far worse than the HoG slot. The Tetris slot for starters should not be on your list of games to play today or ever. But there’s one place that could make your dreams come true. Not just if you like to play slots, but if you’re looking for a new casino to play at. Because with regular slot tournaments, a casino loyalty program that likes to reward you for not just playing but using their site, Vera and John casino could become your new favourite. We know one thing for sure, Kevin won’t want to try his luck anywhere else in the near future. 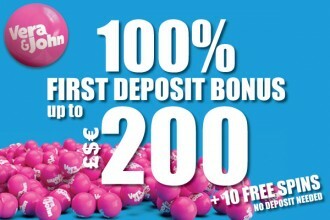 Go sign up for free to Vera & John and see what this generous and friendly casino has to offer you.